It must be the season of drive failures, my pc has just decided that my data drive is missing luckily I back up hourly and 2 hourly to two different drives so minimum loss if the drive has indeed failed but it could just be windows telling porkies, there's another day tomorrow all untouched to look at it. Don't ask why I keep backups!!!! I have three separate backups and never have more than two connected to the PC in case of ransomware attacks. Years ago I put in place a policy that everyone should keep their files on a fileserver with RAID and regular automated backups with regular changes of backup sets. Of course one staff member decided they wanted to keep all their precious data (years of it) safe on their own machine. Guess whose hard disk drive died? We also suffered a server crash once, virtually all the staff lost a few hour's work. A few years back. my QNAP NAS (mirrored drive) failed and bricked both HDDs so I lost everything on them. Luckily I had periodically backed it up but I was still well pissed off. The root cause was the external PSU going West, corrupting the HDDs and/or controller as it gradually failed. No excuse for not backing up. These days it is often just a case of plugging an external (pocket) drive in and it will do the rest automatically. I did two things today. I cut some new nameplates for my freelance 5" gauge 0-4-0 because the ones I did before looked far too big when I went to put them on. Should have printed them out for a trial but I didn't have to loco home until last weekend. The new nameplates gave me a chance to try holding the brass down on the MDF with masking tape and superglue. It worked well and held the brass flat. The superglue let go in a few places allowing a small amount of lift. On one plate this wasn't significant because it was off the end of the job and on the other I noticed it before I started so flooded some more glue in there and weighed it down for about 20 mins. I noticed a small unmachined fragment in the lower void of the 'E' after a coat of black paint so that needs cutting down manually later once the paint dries. There was one exciting moment when I went to profile around the outside of the plate and forgot to change Cut2D's default feed units of mm/sec to mm/min! I'm assuming the table moved at it's max rate but the 2mm cutter didn't break... I was equally relieved and impressed. The finish was rubbish though. The other thing I did was move the lathe off the wooden blocks and further away from the mill to re-open the passage between the two so I can get around them easily. The move went without incident this time. The lathe is still a bit unsteady at the tailstock end so that part of the stand is obviously not much good. When it was on the blocks I could just move one of the two tailstock end blocks by hand with no resistance. I think some adjustable feet might be a project in the near future unless the batch of brake parts I make on it soon come out ok, in which case I'll leave it alone. I really hate working on the machines or tooling rather than the project or loco I'm trying to build. That was actually all yesterday. Today I am going to fix that little unmachined bit on the nameplates, fix a piece of plywood to the bottom of a tool cabinet that is of such appalling quality the castors screws simply pulled out while moving it around (don't but tool cabinets via eBay! ), and perhaps making a start on the CAM for the weight reduction pocketing of the sandboxes I made last week. It would be quicker to do it manually but I need to learn to use my new machine for something other than faux-cast plaques. I feel for you Mark. It's always a shame breaking a larger cutter. As long as the job's not ruined things could be worse. I had a computer monitor failure yesterday. New SOTA thing arriving today, plus replacement electrolytic capacitors for the old one. In my experience a dead monitor is nearly always a dried out electrolytic and at £3.22 for a complete new set I have to try. To be fair, most of the problems with windows tend to be caused by additional software and drivers. Those that aren't tend to get patched for free, and the number and frequency of patches is comparable to those of other operating systems. I'm not seeing windows through rose tinted spectacles, I ran up to 6 dialects of unix since 1982, windows since 1996 and linux since 1998 at work and home and the latter two at home since leaving work in 2016. I found two sources of problems and have applied appropriate slapping upside of my head! Adjusted everything and it's not working like it should be. The lesson was probably worth wrecking the milling cutters, just to make me remember next time. I finally finished the water tank for my Burrell-Boydell engine today. It is made from 1/16" brass sheet with brass angles and reinforcements for the pumps inside, and no end of 1/16" diameter snap head rivets followed by soft solder to seal any gaps. There are four pumps to be fitted, one each side for filling the tank, one on the RH side, worked from the boiler filling pump, to feed the boiler and, with luck, another pump on the rear, worked by hand to fill the boiler and to provide back up to the engine driven pump. I say with luck because the ram will need to be horizontal to fit in the space but I'm hoping that a nitrile ball and a soft spring will work. Nice. Did you mill the 'serrations' or drill them before turning the diameter down? Thanks Mark. I milled the serrations by clamping the stock vertically on the rotary table (or BCA table in my case), and plunging with a slot drill. Then back on the lathe to clean up the diameter and part off. I think I’ll make a couple those to replace some knurled ones which really don’t have enough grip. Spent the morning yesterday making handles for woodturning tools, it's a while since I did any wood turning. I then made the tools. Got the cam follower radius aid finished and had used a recently bought Vertex 6" rotary table with a Myford 3 jaw chuck on it to machine a non critical dimension. Found the 2 Morse taper chuck holder was out as well this was bought with the new table. Chuck register 0.0015" small and when turned in Myford headstock 0.004" on DTI checked a genuine old 2 MT chuck holder and DTI hardly moved. Good job when using the table to machine my cams it was on a home made 2 MT holder. 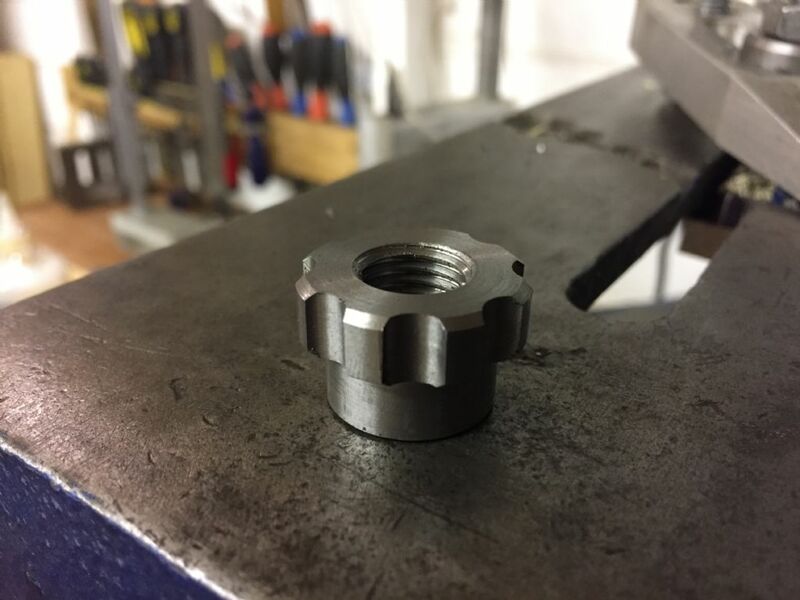 Some of these tool accessories today are not always accurately made an ER collet chuck bought some years ago had to be replaced as thread was very undersize. I know industrial tooling is very expensive compared to hobby stuff but still should not to out of accuracy by as much as the chuck holder. A lesson learnt if possible check if running true with DTI etc. new accessories. Machined radius on test piece cam follower with a carbide cutter will try the Alexander grinder on it tomorrow with a light skim. I put a test bar in the chuck first and found the jaws need truing as slightly tapered another grinding job. 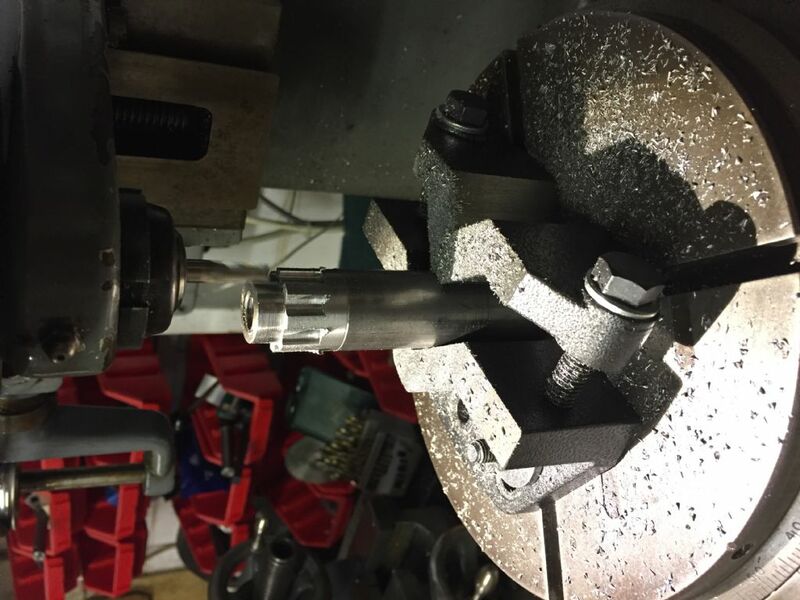 So used an ER collet chuck I had modified to fit the Myford thread to hold the follower radius aid. As a first attempt to Tig stellite apart from an inclusion probably a bit of tungsten electrode when I touched with electrode it 's better than I thought it would be. So this weekend 3 blanks to build up with stellite after have been to see record attempts at Elvington. A French World record attempt contender will be there with a custom 500cc bike. Over the last few days I got that piece of wood on the bottom of the toolbox, made the front and mid brake hanger pedestals and bottom cross bars, and rounded over the corners of the sandboxes. The photo of the sandboxes shows one straight off the machine and the other one after about 10 mins with the sandpaper. The ends of the sandboxes look rough because they were done with a roughing end mill. The rounding over was done with a 12mm end mill as I don't have any corner rounding end mills.